A WORRIED group of MPs have written to Britain’s top defence minister over fears a delay in replacing the Royal Navy’s aging fleet of frigates could put the UK’s new aircraft carriers at risk. The government’s defence committee has called on Michael Fallon to clarify the building programme of the Senior Service’s next generation of warships, the Type 26 Global Combat Ship. It comes after concerns were raised by two former First Sea Lords that any setbacks in the programme could threaten the future safety of the new Queen Elizabeth-class aircraft carriers – which will be based in Portsmouth. In their letter, the MPs called on the former minister for Portsmouth to reveal ‘the implications of the current delay’ in replacing the Type 23s and ‘whether the intention remains for one Type 23 to be replaced when each Type 26 comes into service’. And they asked for answers on the impact any lag in building the vessels could have on ‘the overall number of ships available’ to the navy, and whether the five additional lightweight, general purpose frigates will be built ‘before, after or alongside’ the Type 26s. Mr Fallon has not yet given a formal response to the questions. But speaking to The News, the defence secretary stressed the government remained ‘committed’ to constructing the navy’s next generation of frigates. The letter came just weeks after the Commons Defence Committee were given a stark warning by the navy’s ex top sailor, Admiral Lord Alan West. He claimed the government had ‘run out of money’ and accused ministers of deceiving the public over ordering the new Type 26 fleet – which will replace the current Type 23s. 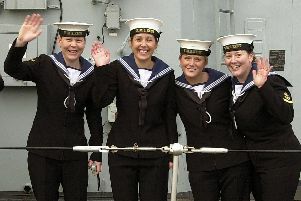 Another former First Sea Lord, Admiral Sir Mark Stanhop, said if action was not taken to replace the Type 23s, the navy’s new flagships would be protected by some ‘very, very old ladies in their mid-thirties’. There are 13 frigates in the navy – six of which are based in Portsmouth. The last Type 23 commissioned was in 2001. The ships have a shelf life of 17 years. Work on the Type 26s was due to begin this year but has been delayed until 2018.